This picture was taken right in our own front yard. 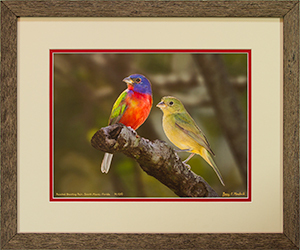 Painted Buntings (Passerina ciris) are small birds (about 5½ inches) that have shown a significant decline in population over the last thirty-five years. The Atlantic coastal population breeds from North Carolina south to central Florida, and winters in southern Florida. They are shy birds that like low bushes and eat mostly seeds and insects. 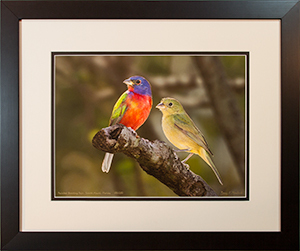 The bird on the left is an adult male, while the female (or immature male) is on the right. Several visitors to our booth have remarked how unusual it is to see the male and female next to each other like this, but Nancy has been reluctant until recently to admit that this was a composite. These are consecutive photographs. The male was captured first and the female was captured about two minutes later. Their positions on the branch were as shown so that no fancy editing was required. 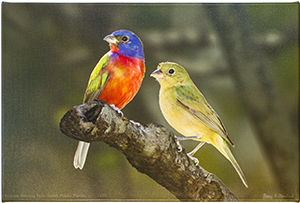 Why Doesn’t The Female Painted Bunting Get Any Respect? Photographic details: Canon EOS 30D camera w/ EF 100-400mm f/4.5-5.6L IS USM lens set at 365mm. Flash was used. Camera was set for f/10 on aperture priority with -1/3 stop exposure compensation, resulting in a shutter speed of 1/160 sec for the male and 1/125 sec for the female at ISO 400. 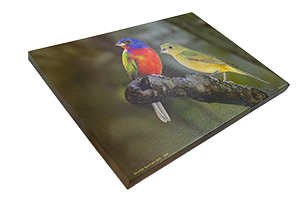 Fine Art Paper 12" x 18" 26" x 36"
Canvas 24" x 34" 34" x 49"
We used to have a different numbering system for prints on fine art paper than for print on canvas, as described in our blog post We’ve Changed Our Numbering System Again. 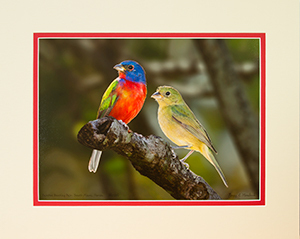 For the Painted Bunting Pair, the consolidated numbering system began at #23 (after 14 paper prints and 8 canvas prints had been made). Copyright © 2019 Bee Happy Graphics LLC. All images and the design of this Web site are protected under federal copyright laws. Purchase of any print shall in no way constitute a license for reproduction or any commercial use of the image. 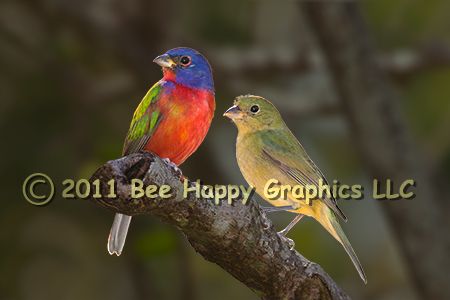 Any downloading, duplication or reproduction of any part of this Web site by any method whatsoever without the expressed written permission of Bee Happy Graphics LLC is strictly prohibited.